Eleanor White moved to Ullapool in 1994 where she established Bridge House Art, a school which runs both a summer school and a full time portfolio course during the winter months. The inception for this was her involvement and teaching at both the Edinburgh Academy and the Leith School of Art where she taught for six years. 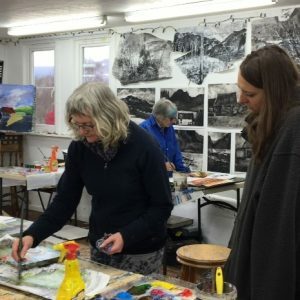 Eleanor has been the invited guest tutor for Rufus Reade Tours Edinburgh for over 20 years, and has had the privilege of travelling and painting in many exotic and exciting locations around the world. She is also a guest tutor for Arbuthnott holidays in Andalucia, Spain. Her year is split into full time teaching for Bridge House Art, community education, and travelling workshops around the UK and Spain, along with working towards exhibitions in the UK. You can view the details for Eleanor’s course here.